Having any sort of political clout when you are young is still an unattainable dream. It’s reserved for older generations, those who have been around and thus (it is assumed) have the competency to solve everyone’s problems. Take for example running for President in the United States. You cannot run for President unless you are thirty-five years old, and Barack Obama at the ripe old age of 47 was considered by many too young and too inexperienced to run a country. Granted world leaders should have some age on them, and plenty of experience to boot but should age, limit anyone from positively contributing to a political scene? No. I happened to stumble into a conversation the youth and the UN, in which the person referred to it as Mock UN. I had to correct them and explain that it was Youth Take Over. 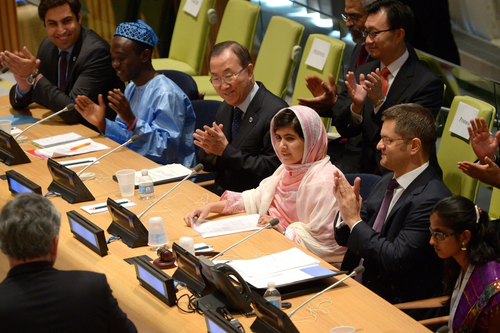 Malala had spoken, and a youth advocate from Sierra Leone, Chernor Bar, was leading the proceedings. For those who weren’t really following the event, it seemed as though world leaders let some kids play house in the General Assembly. Well, guess what, they weren’t playing. Growing up I was MUNer, I did Model UN all four years of high-school. Calling it Mock UN, got me thinking. Mock truly implies that the action is fake. It was ‘MODEL’ United Nations because ‘MOCK’ was Mock Trial and that was for lawyers to be, we were saving the world! Model seems to be a bit vaguer and more about emulating our future; we were actively pursuing a hands on education and job training for a profession in the international political arena. What we were doing was not real, if our resolutions passed they weren’t going on to the Security Council, bubonic plagues or hostage situations lasted until about 6 P.M. when the meet was over, and at the end of the day some went home ‘winners’ with gavels and certificates in hand like any other sports competition (probably sans gavels though). That does not mean that it didn’t instill in me a sense of capability. I understood how difficult it was to get everyone in a room to discuss the same topic or problem, let alone agree on a possible solution. I learned about forming international law and just how blurry lines of sovereignty and concepts of responsibility are. I have also been lucky enough to see that people my age are able to do more than sit in a classroom on a Saturday afternoon arguing with teens from other high-schools about whether NATO can demand to see the plants in Iran. Sometimes this means walking away from a gunshot wound. This year, it means addressing the Secretary General and demanding that member states listen to the children who so desperately need others to fix the educational system in the world. Many have written about this historic occasion and framed it as a gender issue. That is just one aspect of this dilemma though. In fellow blogger, Waleska’s, wonderful piece: “The Girl is Rising to Demand Education but It’s not just a Developing World Problem” we see that there are many underlying issues with simply equating education with a way out, and especially limiting the education problem to the developing world. 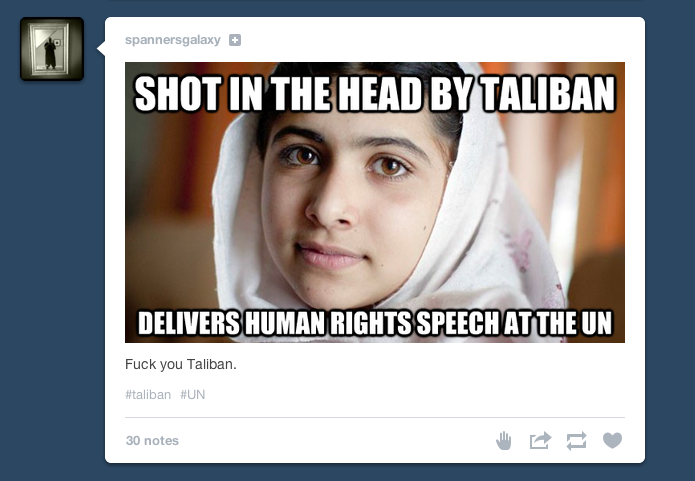 What if this isn’t about Malala being a girl, what if it’s about her being a girl and not a woman. She turned sixteen years old yesterday. If you are an adult, what were you doing at 16? Or 22? Or now? 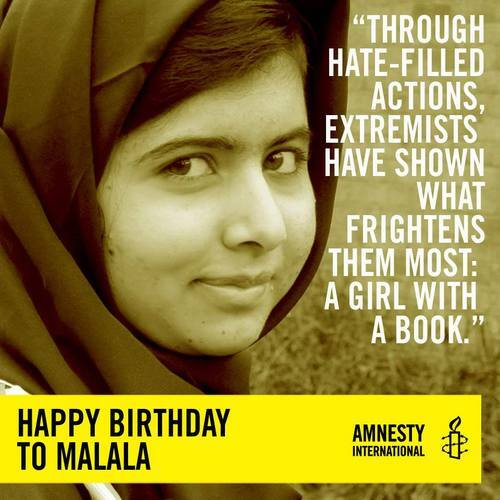 Before she turned 16 Malala took on one of the worlds largest terrorist organizations and lived. They brought the fight to her, she didn’t purposely seek out a cell or arm herself with a machine gun, she got on a bus and went to school. In referring to that day Chernor Bar said: “The Taliban decided to attack our dear Malala and what a mistake they made. They simply helped wake a sleeping giant.” That sleeping giant is the lack of education so many children experience and the struggle it is for the ones that try to achieve it anyway. In development classes many now recognize that successful and sustainable development has to be in the hands of the people whose community is ‘developing.’ Many are trying to embrace a new era of development after ‘Band Aid’ and ‘White Man’s Burden.’ Today we all should be embracing a new movement: the youth. The cliché of children are the future is meaningless unless we actually allow them to voice opinions. If aid workers should no longer waltz into a ‘third world country’ and act on their own plan devised without the say or input of the community, why is anyone waltzing into a school without asking the students? Yesterday the Youth Takeover passed ‘The Youth Resolution: The Education We Want’ and it outlines the demands of children and students around the world. When looking to solve issues of maternal health and eradicating hunger, it is common to consult experts. Scholars and politicians alike spend countless hours researching, discussing, and developing strategies to achieve benchmarks that get us closer to ‘fixing the problem.’ Are we ignoring students simply because they’re children? They are ones attempting to go to school, the ones sharing books or reading them upside because there aren’t enough to go around, the ones sitting on the floor because education is their utmost priority (). Youth have no problem adopting a girl – a child – as a role model. She is much more important than a role model though, she is a leader among many youths that insist people listen to them. This isn’t the first time this has happened. Anjali Appadurai, a student at the College of the Atlantic, spoke at the United Nations Climate Change Conference in Durban, South Africa in 2011. A great takeaway moment from her now heralded ‘Get it done’ rant against the failed progress of the world’s leaders was when she stated: “The science says we have five years maximum, you’re saying give us ten. The most stark betrayal of your generation’s responsibility to ours is that you call this ambition”. She continued to blast the room for lack of courage and concludes “real ambition exists in this room but it is being dismissed as radicalism.” Do you know what happened next? The COP president wondered aloud: Why is it we let half of the population speak not first but last? Why do we allow the youth to speak last, why are their inclusion a special occasion rather than a permanent prominent spot in discussions that affect their lives and their future? Finally why does it take a child telling the Taliban she is not afraid of them, for children to gain the attention of the world. We should have started listening sooner, I and others who believe in the capability of the youth will continue to advocate for their voices to cause change rather than head nods and cursory glances in their direction. As one of the Youth Advocacy Group members stated yesterday: ‘silence is the loudest approval of all,’ so we need to join in the chant of “We are Malala” not because she is brave, not because she is a girl, but because she is a child and she cannot fix what we have broken alone.